A capacitor is a passive device used primarily for electrical energy storage and release. It can serve in many functions, including coupling/decoupling, transient voltage and current suppression, frequency tuning, filtering, DC Block and RF Bypass. A capacitor is a two-terminal device consisting of 2 metal plates separated by a layer of dielectric. Capacitors can be either fixed or variable. In order to meet a myriad of different requirements, there is an extensive variety of capacitor types available, each one having its own value proposition. 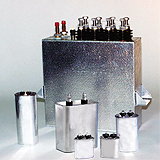 Vacuum is an ideal dielectric and enables this technology to be considered in many demanding applications. Richardson Electronics carries a wide variety of vacuum capacitors ranging from 12pF to 5,000pF and covering test voltages of 5kV to 60 kV. Select from a full range of fixed, variable, and water-cooled capacitors for use in wafer-fabrication, plasma, medical, broadcast, and industrial heating applications. Learn More -> Download our Product Guide Today! Richardson Electronics offers an extensive line of ceramic RF power capacitors ideally suited for high voltage and high current applications. 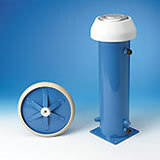 Capacitor configurations include: Plate, Barrel, Feed Through, Tubular and Pot styles. We stock a wide selection of ceramic RF power capacitors with capacitance values extending from the lower picofarad (pF) range up to the nanofarad (nF) range, 5kV to 40kV. Richardson Electronics offers a wide selection of high voltage capacitors utilizing synthetic-based dielectrics. Hydrocarbon and polymer technology provides all types of film and paper dielectrics, metalized and discrete foil electrodes, oil-filled and dry construction designs and a wide variety of packaging options, including both metal and plastic casings. To help satisfy demanding DC, pulse, and high frequency AC applications, a variety of product types are available including: advanced film capacitors, high energy capacitors, high voltage capacitors, metallized capacitors, fast pulse capacitors and high current capacitors. For large R&D or OEM projects, let our team help design a customized solution for you. 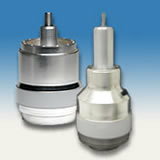 Capacitor Hardware is an important capacitor accessory in many systems. In order to mechanically mount certain oil filled, vacuum and power film capacitors, a variety of brackets, flanges, protective boots, and other hardware pieces are necessary. Used properly, the hardware helps to minimize any adverse effects of vibration and ensure a reliable, long-lasting design.? ?Richardson Electronics is pleased to work with industry-leading manufacturers GE, National, and Jennings Technology to provide a wide range of capacitor hardware to accompany our vast selection of capacitors. 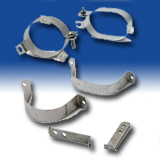 Our engineering team can offer assistance in matching the correct hardware accessories to your specific capacitor.